Take I-77 north to exit 10 (Trade St). At bottom of exit turn right onto W Trade St. In about 1/10th of a mile, veer right off of Trade St onto Johnson and Wales Way. At next light, Johnson Wales Way merges into W 4th St, turn left at this light and go about 1/4th of a mile to Graham St. Arrive at BB&T Ballpark! If coming from Gastonia or University area, take I-85 to I-77. Take I-77 south to exit 11 (I-277/Brookshire). Exit off I-77 at exit 11, veer left toward Uptown/I-277. After about a 1/2 of a mile, take exit 4 off of I-277 onto Graham St/US 29. At bottom of exit merge right and reach stop light. At light turn left onto N Graham St heading south. Continue on Graham St for about 1 mile. Arrive at BB&T Ballpark! 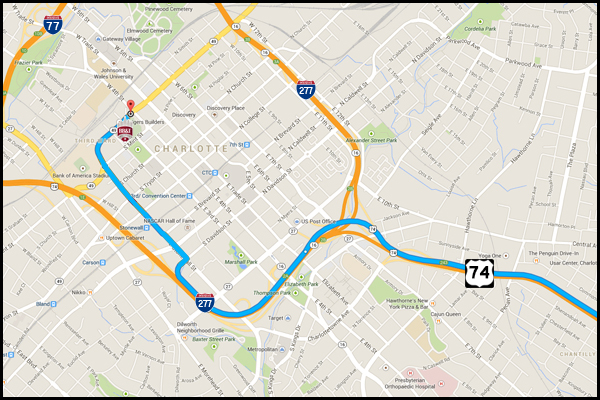 Take US 74/Independence Blvd into Uptown Charlotte. Merge onto I-277 South/US 74 West. 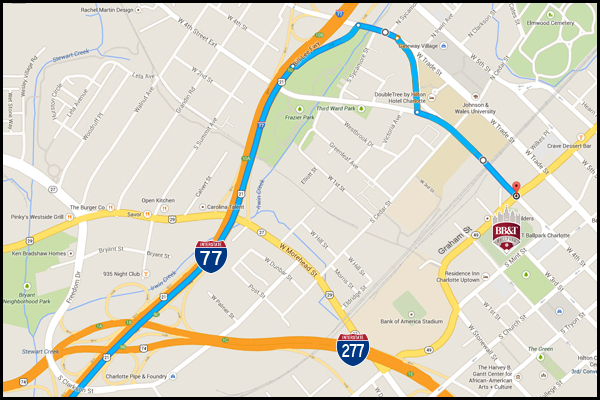 Once on 277, take exit 1E (Stonewall St). After exiting, you will come to a light, turn left at light onto Stonewall St. Continue on Stonewall until the road renames to Graham St, after about 1 mile, arrive at BB&T Ballpark! There are many available parking lots and parking decks around Uptown Charlotte with evening parking rates (usually after 5pm). Many are within a short walking distance of BB&T Ballpark. 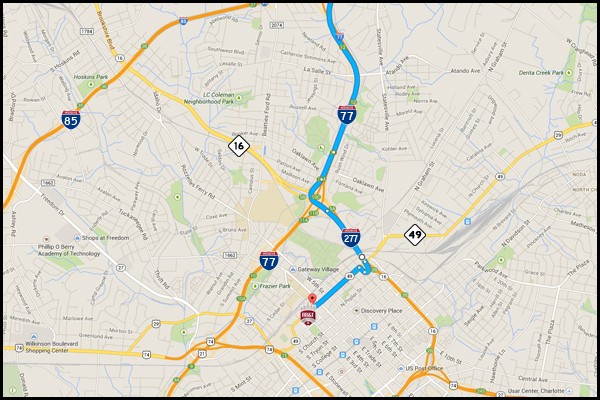 Below is an aerial summary of nearby parking to BB&T Ballpark. 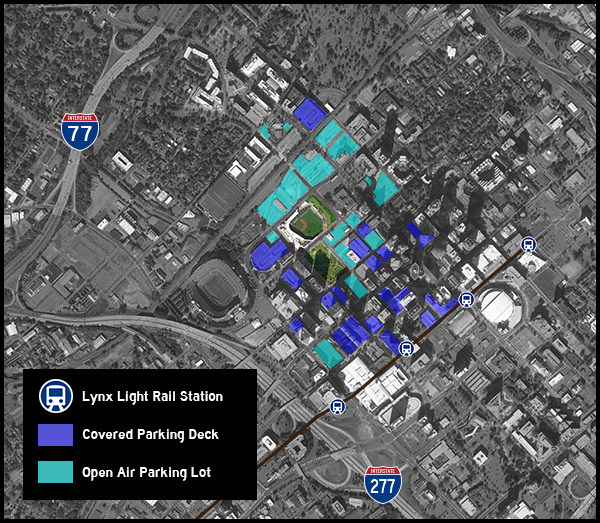 Light blue represents open air lots & dark blue represents parking decks. For a full description of parking options available in Uptown Charlotte, you can download a PDF page from our friends at Charlotte Center City Partners that gives you a full detailed street map of Uptown Charlotte along with detailed parking lot labels that include # of spaces available at each lot.